Are you thinking of a healthy snack to munch on in the evenings with your cup of coffee or tea??? Here's a very interesting and healthy recipe which can be savoured any time of the year - rain or sunshine!!! Low calorie - no deep frying required. Protein in nuts and gram. 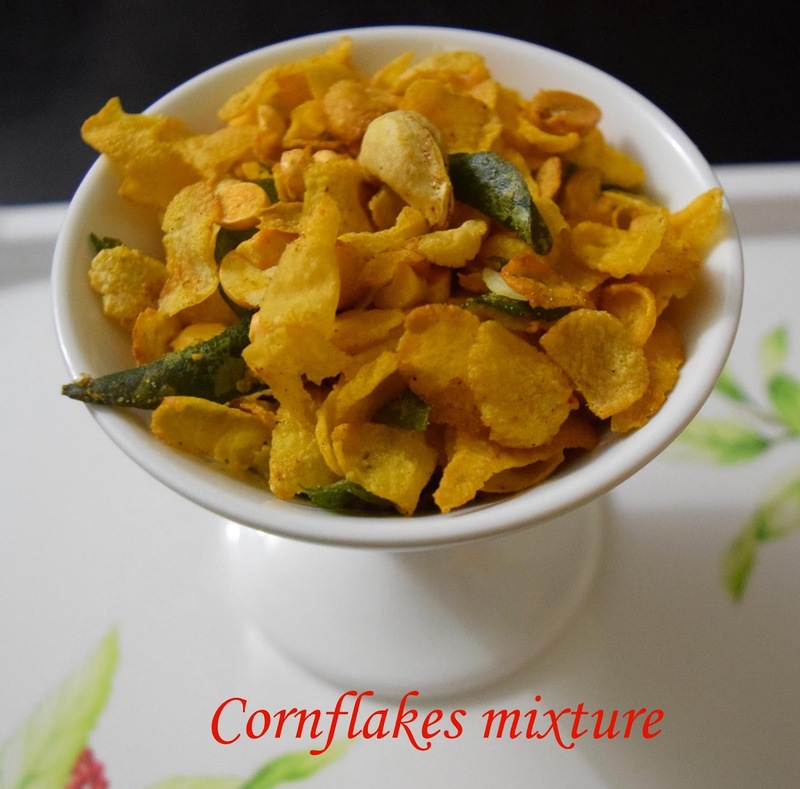 Adequate nutrients from corn flakes, nuts and curry leaves. Goes well with your cup of coffee or tea. Can be stored and keeps well for a week. So, what are you waiting for? Go ahead and try this! 1. Heat the oil in a pan. Add the curry leaves and fry till they become crisp. 2. In the same oil, add the peanuts, cashew nuts and roasted gram. Roast till the nuts are crisp. Make sure not to over brown the nuts and gram. Mix half of the chilli powder, turmeric powder, hing and salt to this and keep aside. 3. In the same pan add the cornflakes and roast till it becomes very crisp. Mix the rest of the chilli powder, turmeric powder, hing and salt to this. 4. Now mix the cornflakes, curry leaves and nuts and your mixture is ready. Store in an airtight container. This recipe is an entry to Monsoon Snack Challenge for The Hub @ Archana’s Kitchen challenges. Super Ani I tried it today. Abhay liked it a lot. I added Raisins n little sugar powder. Very nice to know, Archu and good variation for kids.